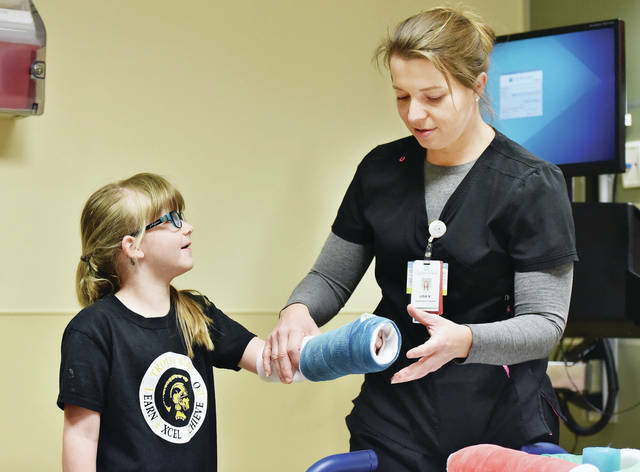 Zoey Wehrman, left, 6, of Botkins, daughter of Robyn and Jared Wehrman, has a cast put on her arm by emergency room registered nurse Lisa Vondrell, of St. Marys, during a “Make Believe Hospital” at Joint Township District Memorial Hospital on Thursday, April 11. Students from around the area took part in the learning experience to alleviate common childhood fears and misconceptions about hospitals. Students rotated through stations that taught kids about different aspects of a hospital. 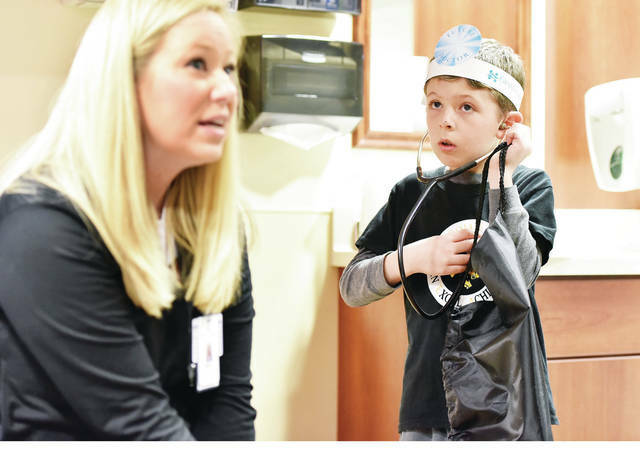 Botkins 1st grader Caedyn Mihm, left, 7, of St. Marys, son of Misty and Lance Mihm, listens to his heart with a stethoscope while cardiovascular technician Nikki Cisco, of St. Marys, talks to a group of Botkins students at Joint Township District Memorial Hospital on Thursday, April 11. Students from around the area took part in a "Make Believe Hospital" to alleviate common childhood fears and misconceptions about hospitals.